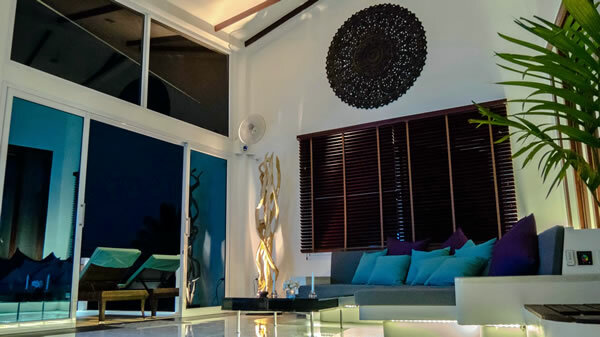 The spacious luxury pool villa has an open-plan design with ceiling-heights up to 5m, providing a loft-like feeling. Room-high glass windows and sliding doors at the front ease the access to the terrace and amplify a light-flooded feeling indoors. 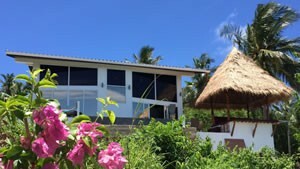 Your villa is quite unique as the positioning and the custom architectural design, which you will not find anywhere else on Koh Tao, allow unobstructed sea view from almost every corner of the house – even from the toilet. Inside, the living and kitchen area are on split levels, separated by a few steps, both facing the view down to Chalok bay. 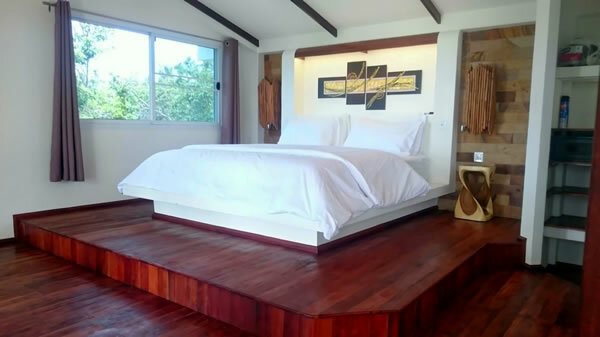 The adjoining bedroom with it’s floor length sliding doors to the living area has an en-suite walk-trough closet with enough storage for your clothes and suitcases. The bathroom is accessible either from the living- and kitchen area or the walk-through closet. 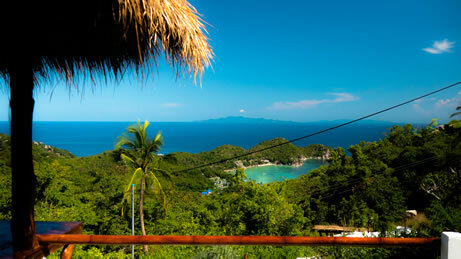 amazing 180° island-, bay- and seaviews from sunrise to sunset over the Gulf of Thailand. On clear days you can see the nearby islands Koh Phangan, Koh Samui and even Ang Thong National Marine Park in the distance. Horizon is quite unique as the positioning and architectural design of the villa allows sea view from almost every corner of the house. 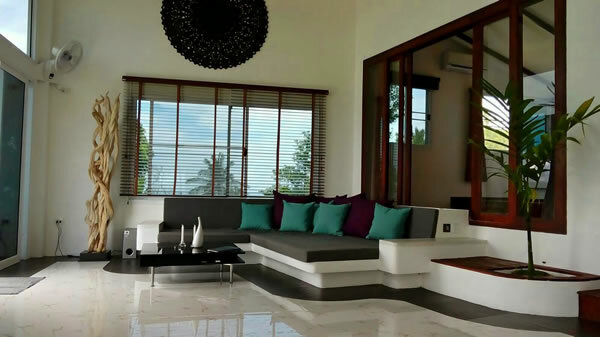 Your spacious villa has an open-plan design, providing a loft-like feeling. Room-high windows and large sliding doors at the front amplify a light-flooded athmosphere indoors. 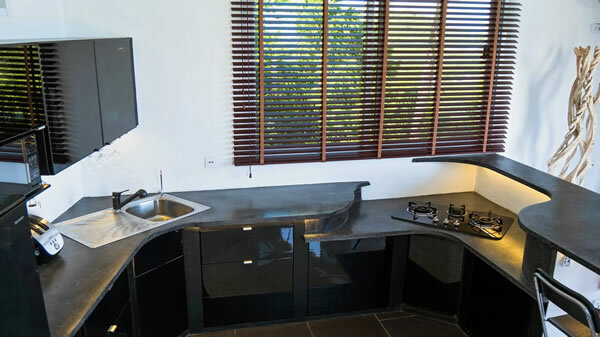 Inside, the living- and kitchen area are on split levels, separated by a few steps, both facing beautiful Chalok bay. The adjoining bedroom with it’s floor length sliding doors to the living area has an en-suite walk-trough closet with enough storage for your clothes and suitcases . The bathroom is accessible either from the living- and kitchen area or the walk-through closet. 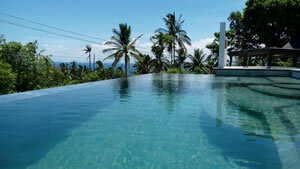 4,6m x 2,6m private infinity pool with tanning-ledge, water feature and multi-color LED ambient lighting. Your pool is tiled with 3 different natural indonesian vulcano stones to ensure that luxury feeling you know from balinese high-end resorts. Your pool is tiled with 3 different natural Indonesian volcano stones to ensure that luxury feeling you know from Balinese high-end resorts. 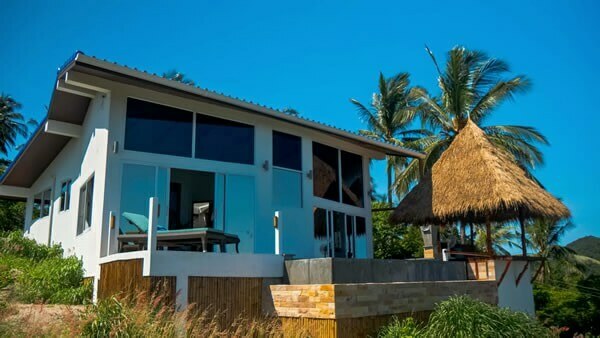 Book your villa – now! Horizon’s living area transfers a loft-like feeling through room-high windows and high ceilings for a bright and airy ambience. The huge comfy L-shaped day bed invites to chill, read or nap. A wall fan and also the window with mosquito screen cools you off while watching one of the many pre-loaded movies of the Android Media System. This system also offers a large variety of any kinds of music which even sounds better with the automatically connected Sound Bar and its subwoofer. The 55” flatscreen TV and the fast glassfibre optic internet also invites to browse through the net. Color-changeable LED lights around the sofa create a cozy atmosphere, as do the dimmable main lights in the living room. For your comfort most appliances can be controlled by remote controls, even the floor lamp. The bedroom with its floor length sliding doors to the living room provides the perfect sea view even from your bed. The wooden flooring and chosen colours of curtains and furnitures give a warm atmosphere. Windows are mosquito screened but for perfect sleep, a remote controlled wall fan and a special “constant temperature” inverter aircondition will give you the coolness you seek for. The 42″ flatscreen TV is connected to the Android media system, so you can watch movies even from your bed. A special custom designed solid wood desk and stool can be used for those who have to work during their holidays – we hope you will only have to use it for writing postcards! The adjoining closet provides enough space for your clothes and suitcases and the built-in safe with light and charger-plug will take care of your valuables while you explore the island. 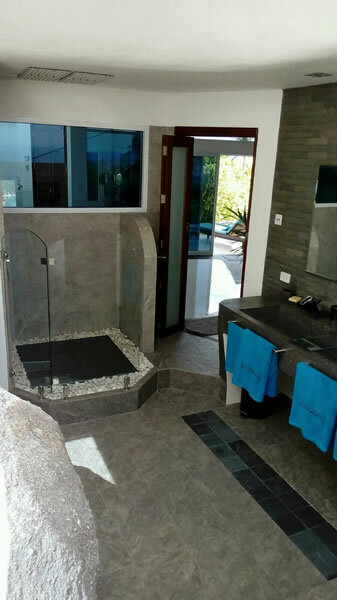 Your villa’s bathroom also has a very unique design – not only that the ceilings are curved but also a natural rock is built-in. 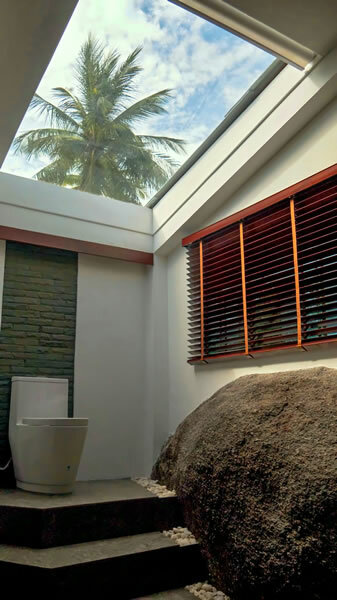 A glass-roof with an automatic, timer-controlled blind above the toilet provides a tropical inside-out feeling and brightens the room. 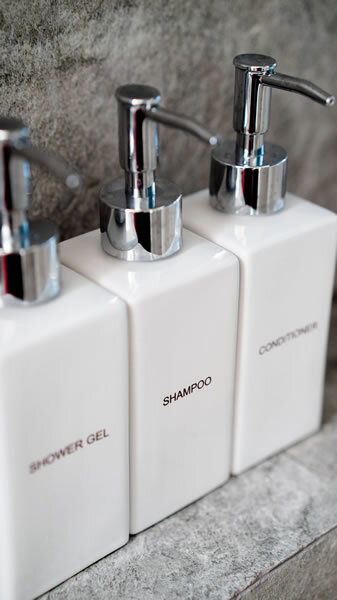 The extra large double basin provides lots of space for your own toiletries besides the ones that are offered already. 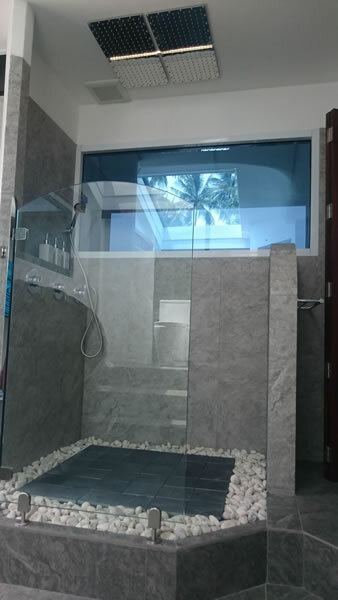 The rain shower with its 4 big shower heads invites to shower either alone or together (to save water ). LED lighting at the shower heads, behind the toilet or around the mirrors at the sink provide a comfortable setting. The modern custom designed kitchen is seperated from the living room through 3 steps. It offers a big working space, all necessary table- and cookware and spices for you to use for free. The gas hob on a lower level than the counter itself, makes even cooking comfortable. A drinking water tap caters free, filtered drinking water without the hassle to carry heavy bottles to the villa. 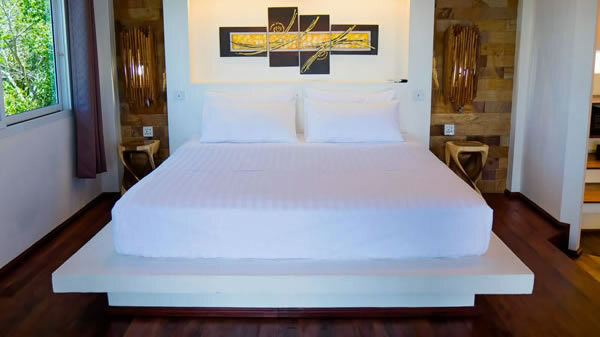 All convenient appliances and a well-stocked minibar are provided for your comfort. 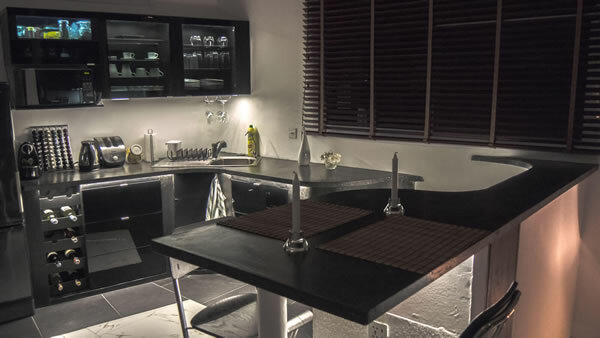 LED lights around the counter and in the glass cupboards amplify a homely feeling. A remote controlled wall fan and a big window with mosquito screen offer a breeze at day and night time. One of our favourite areas is outdoors of course. 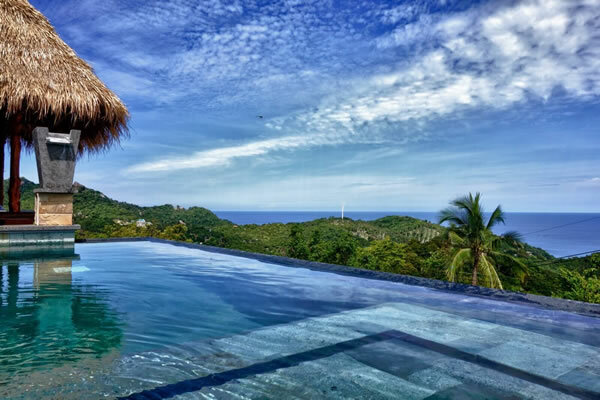 Stunning and wide sea and jungle views you can enjoy from either the roofed sala, the dining area, from the sunloungers or while sitting in your private infinity pool. 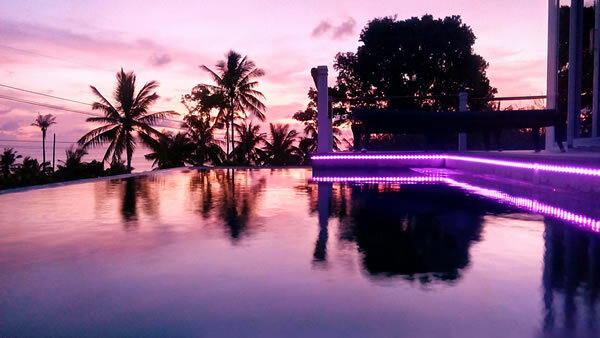 The pool is tiled with Indonesian natural volcano stones, offers a waterfall feature and also colour changeable LED lights in addition to the normal pool lights for more ambience at night time. The tanning ledge is perfect to soak up the sun but still be covered with water to stay cool. 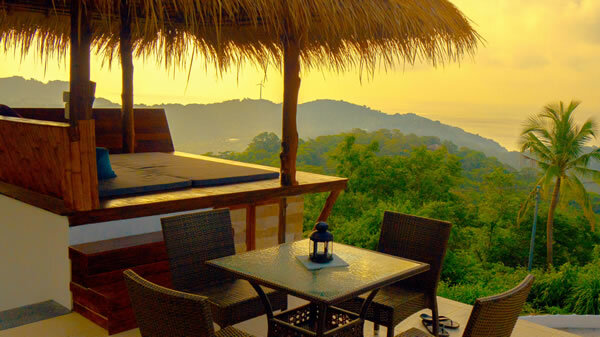 Since the terrace is facing South with beautiful views to Chalok Bay and Koh Phangan in the distance, you can see sunrise to one, and sunset to the other side. 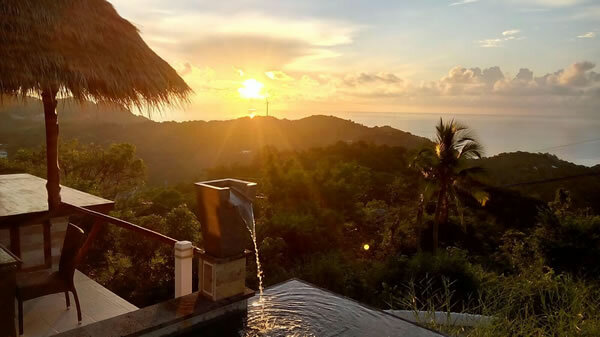 Your villa is located close to the village of Chalok, on top of the hill yet easy accessible on the road leading to Sai Nuan Beach or June Juea Bay in the Southwest of Koh Tao, allowing the most spectacular views over the vegetation and 180° over the sea. On clear days you can even see the islands of Koh Phangan, Koh Samui and even Ang Thong National Marine Park in the distance. The location, away from the hectic and all-nightly noise of Sairee Beach, yet close to some of the best beaches of Koh Tao ensures relaxation, serenity and privacy. The FREE SCOOTER will take you anywhere on the island within minutes.